Fall in love with your tender. Carbon Craft builds the safest, most luxurious tenders for your 65'+ yacht. We believe your tender, the lifeline for your yacht, should be something you and your guests will actually love using. Our innovative, multi-functional, closed cell foam collar as well as our use of carbon fiber allows for an industry-defining design offering deep hull protection, a dry ride, unmatched style... and lots of fun. The yacht tender you'll actually love using. 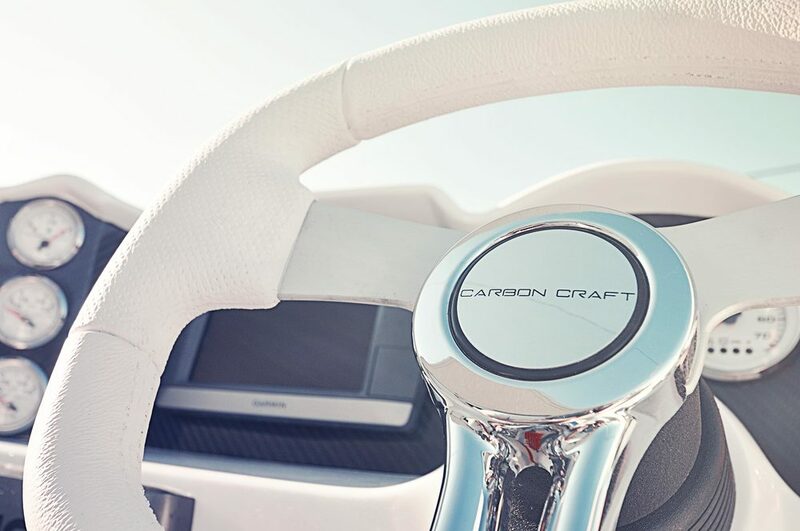 All Carbon Craft models offer industry leading seating capacity and comfort, as well as nearly twice the usable interior space compared to an inflatable design. Turn heads as you comfortably and safely bring up to 10 of your guests ashore in style. Operate Effortlessly. The advanced hull design and intuitive controls enable operators to easily adapt to any condition. Whether cruising at speed or idling in to dock, you are always in control. Board Safely. With increased lateral stability, high freeboard and a wide teak step-rail, boarding with safety and confidence is easier than ever. Stay Dry. Every Carbon Craft tender is distinguished by a colorful closed cell foam collar that protects the tender and your yacht from surface damage. The collar has been designed to deflect spray while underway or approaching wake at harbor speed in order to create a truly dry ride. Offering passengers an experience more inviting than a traditional RIB. Carry Everything. Securely store your valuables and gear inside the gunwale hatches, ski lockers, forward bow locker, water tight trunk, and below seating compartments. Relax In Comfort. Utilizing every inch of available space, the signature interiors of each model surround guest’s in comfort and luxury. With deep sofa-like seating, you’ll feel at home anywhere you go. Arrive In Style. The tender is an extension of your yacht and it is important to keep guests feeling comfortable and safe. Carbon Craft will help bring you to shore comfortably, safely and always in style. A new luxury tender category is born. It was one of the most embarrassing nights of their lives. After a lavish New Year’s Eve celebration in St. Barth’s, Mark and Natalia, dressed to the nines, made their way back down the dock. Seasoned boaters, they secured their shoes and belongings into a garbage bag to stay dry. From the inflatable tender he extended his hand to help her board. But even keen balance and years of experience could not save her from slipping on the wet rubber tube. She plunged into the dark, cold water below. Not about to let go, and with very little to retain him, he was pulled in after her. They surfaced, drenched in defeat, him with a dislocated shoulder and both feeling there had to be a better way. A Tender designed and built around comfort and safety for the most precious cargo you carry; Your loved ones.